The idea of creating a new Knights of Columbus council in Fairfax grew out of discussions in the Finance Committee of St. Ambrose Church in early 1971. With the encouragement of Father John Rea, the Pastor of St. Ambrose, committee members contacted State Warden Al Ward, of George Brent Council in Manassas, to assist in the formation of the new council. Announcements were placed in bulletins at St. Ambrose and St. Leo's to recruit new members. Organizational meetings took place during the winter and spring of 1971. The goal was to achieve council status prior to the start of the annual State Convention on May 21. Finally, the necessary number of insurance and associate members was reached and on May 14, the council received notification by Supreme of its acceptance as Council 6292. A chartering ceremony took place on May 16 at St. Ambrose that included the initiation of new members, the election of the charter officers and their installation. Ad Brault was installed as Charter Grand Knight, Father John Rea as Chaplain, and Tom Tager as Financial Secretary. In its first few months of existence, the Council was busy establishing itself. Dues were established at $20 per year, meetings were moved from Sunday to Tuesday, and the name Providence was chosen. This choice was based on the Council's location in Providence Magisterial District, the fact that the town of Fairfax was originally called Providence, and on the hope that the membership would benefit from God's Providence. Following the death of its long-time Chaplain, Father Francis J. Diamond, in 1982 the Council voted to change its name in honor of Father Diamond. In 1974, the Council moved to St. Leo's Parish, and held its meetings and activities at the Old Parish Hall. With the efforts of Grand Knight John F. Hogan, Jr., the Council was able to obtain the parish's old two-room schoolhouse as its new home -- Providence Hall. First Bishop of the Arlington Diocese, Thomas J. Welsh celebrated Mass and dedicated the hall in June 1975. From an austere beginning with 27 members and a net worth of $133, the Council, through the efforts of its dedicated and energetic members, has grown into one of the most respected and recognized councils in the jurisdiction of Virginia. Today, the Council has more than 300 members from areas of Northern Virginia and from across the United States, and has amassed a net worth of more than $100,000. During its first 25 years, Council 6292 has donated more that $400,000 to local, state, national, and international charities, and has conducted hundreds of programs for the youth, community, council, church, and family. Annually, the Council elects a board of officers headed by the Grand Knight. The Council is part of a District, overseen by a District Deputy and the Councils and Districts are part of the State, headed by the State Deputy. The States, and councils, report to the Supreme Council, headquartered in New Haven, Connecticut. Father Francis J. Diamond S.J. Reverend Francis J. Diamond S.J. was born in Philadelphia, Pennsylvania, and the 55 years of his religious life were devoted primarily to the youth and young adults. He entered the seminary in Poughkeepsie, New York, at the age of 18. He studied and taught for 12 years before he was ordained in 1940 by Archbishop Curley of Baltimore, Maryland. For the next 17 years, Father Diamond was assigned to various parishes in Southern Maryland, including Morganza, Valley Lee, St. George Island, and Newtown. From 1958 to 1970, Father Diamond preached retreats at Manresa and Faulkner, Maryland. From 1970 to 1974, he was pastor of St. Alphonsus Parish in Woodstock, Maryland, followed by two years at St. Leo's Parish in Fairfax, Virginia, where he became active in the Providence Council No. 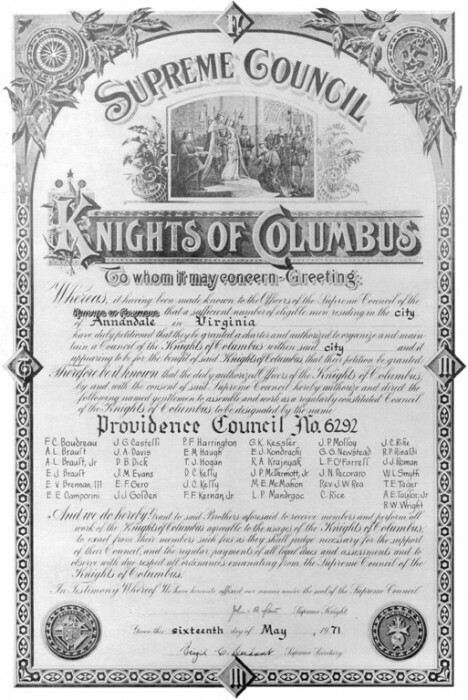 6292 of the Knights of Columbus. The last six years of his religious life were then spent at St. Timothy's Parish in Chantilly, Virginia, as associate pastor. 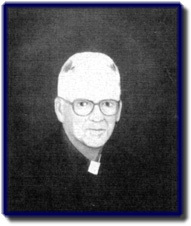 Father Diamond was a long-time member of the Knights of Columbus and served as Chaplain of the Providence Council from 1975 until his death in 1982. As an ardent sportsman, he dedicated his personal time and efforts to to training young people in cross-country and track and fields events. The Father Diamond Track Meet, held annually at George Mason University, was named in his honor.